Next week I’ll share Bookworm’s many food intolerances, but the one that I find most difficult is eggs. Sure I could use flaxseed as a substitute. . . but Bookworm is also intolerant to flaxseed. I’ve moved on to using chia seeds, but at this point, baking remains, well, let’s just say, experimental. There’ve been a lot of food flops in the kitchen this week. One recent flop that I had hoped would turn out was Strawberry Basil Almond Flour Muffins as posted by Tasty Yummies. There were a few problems with the way I made it. First, I didn’t notice until the muffins were in the oven that she recommends using Honeyville brand almond flour rather than the Bob’s Red Mill that I had on hand. Second, I substituted the eggs for the chia sees. While her muffins are beautiful, mine were S.A.D! Not only did mine fall in, but they wouldn’t even come out in one piece. They just fell apart. That’s when my wonderful husband had the idea of turning this into granola. Preheat the oven to 350 degrees and line a muffin tin or spray with gluten free cooking spray. In a small bowl, mix chia seeds and water and set aside for 5 minutes. In another bowl, stir together the almond flour, baking soda and salt. In a large mixing bowl, add the chia seed mixture as well as the maple syrup and coconut oil. Stir to combine and gradually add the dry ingredients until combined. Fill the muffin tin and place in the oven. Bake for 25 to 30 minutes. When the muffins are cool enough to touch, crumble over a cookie sheet. Spread the crumbles across the pain and bake for another 10 minutes or until they reach the crunchiness you like for granola. Let cool and enjoy with a cool glass of milk of your choice. This looks delicious! I just might have to give this one a try. Thanks for sharing!! I like that you were able to turn a recipe that didn’t work into something different and awesome… I think there is a metaphor for life here. 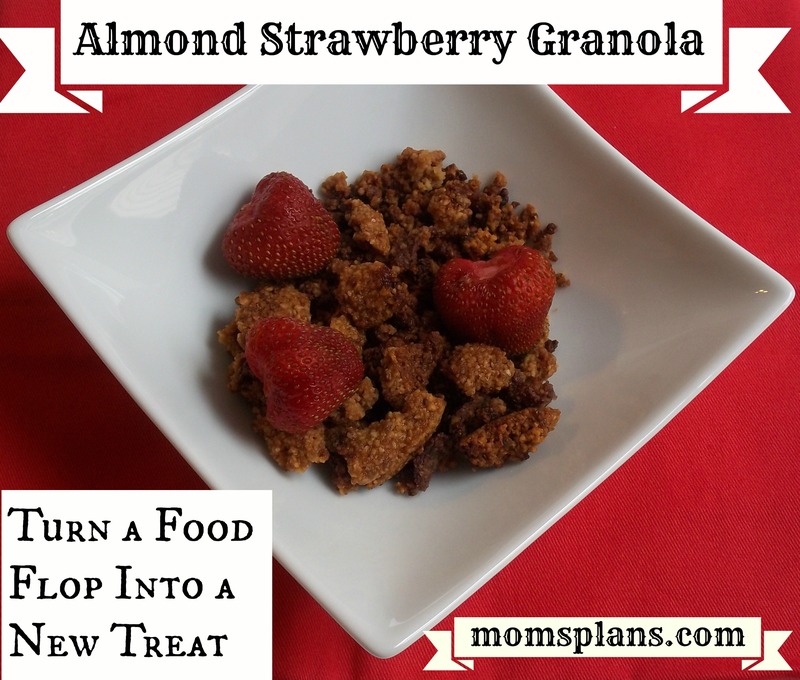 I’ve never made granola but would love to try. This looks great!